Troodos Mountains are situated in the centre of the island of Cyprus and stand at a maximum height of 1952 metres. The most famous of all the mountain ranges in Cyprus, the mountains stretch across the South Western area of Cyprus. The mountains attract many visitors throughout the year in both summer and winter and offer some spectacular views across the region. In summer, the mountains are a fantastic haven for tourists offering great views and beautiful scenery. The traditional picturesque villages nestled among the mountains themselves provide some of the best kept and charming architecture on the island. The winding roads that lead the way to the top of the mountain are laden with history and present great views over these small villages and stunning local scenery of natural beauty. The mountain itself is a perfect place to get away from the hustle and bustle of city life and the main tourist resorts. They also offer peace and tranquillity whilst among a beautiful setting. The Troodos National Forest Park offers the ideal environment for many activities such as: walking, hiking, cycling, exploring, lazing around and having a picnic and even skiing in the winter months. The weather varies on the season. 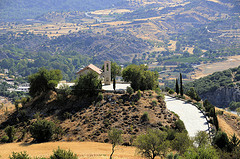 In the summer months, The mountains enjoys the hot temperatures that Cyprus is known for. However, due to their height, in winter the mountains generally have a covering of snow on the top and the temperatures drop considerably. In winter, Troodos mountains are a haven for skiers due to the snow fall that it receives on the peak at Mount Olympus. Yes, it may sound a little surprising but the mountains do have ski slopes and ski lifts. It sounds crazy to imagine that you can be skiing in the morning and then later that afternoon, you can be enjoying the sun by the pool or on the beach in one of the main tourist resorts. There are 4 slopes on the mountain and all cater for all levels and abilities. Throughout the winter months (January – March), the ski lifts on Mount Olympus (the peak of the mountain range) are open from 09.00 – 16.00. There are a selection of hotels situated in the Troodos Mountains and each one has it’s own character and charm. The hotels all vary in price depending on the star rating and cater for all needs and requirements. The hotels in the mountains are all generally of high quality, so you can be assured that you will have a nice relaxing and comfortable stay. To find the best deals, it is advisable to shop around and one of the best ways to do this is to use one of the comparison sites that will search all the hotel networks and then present you with the best deals. The following are very good and generally offer the best deals. If you are visiting Cyprus and are wanting to enjoy exploring the island and don’t want to be on a beach all day, then Troodos mountains offer a full day out.